Nature wins this battle any day of the week. Yesterday my family trekked up to Woodbridge, VA to see the high Class-A affiliate of the Washington Nationals play the Wilmington Blue Rocks (Royals affiliate). It seemed like a great idea at the time, and still did when we got up there. 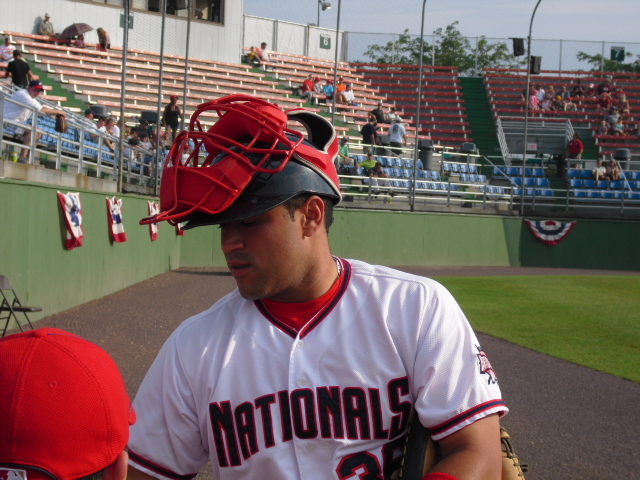 I checked the roster of the P’Nats to see if anyone interesting would be rehabbing on the team. Unfortunately the only major leaguer on their roster was Chien Ming Wang who pitched Saturday night. I was hoping he would at least be there on Sunday so I could get a picture, but no show. There were however a lot of really nice players there who were interacting with the fans before hand. I think at Class-A they are still getting used to the little fame they have. The catcher, Sandy Leon, smiled when he walked away from the kids and either had grills or braces, I couldn’t tell. He went down to the bullpen to warm up with the pitcher, Daniel Rosenbaum. The clouds began to move in closer to the stadium as the game started. The Blue Rocks scored three runs in the first inning, highlighted by John Whittleman’s two-run homer. The Nats scored one run in the third on a groundout in which Cutter Dykstra was tagged out between second and third on a boneheaded baserunning play. I assume he thought the ball was going to get through the infield, but the shortstop fielded the grounder cleanly and Dykstra was caught up running to third. It seems like the son of a baseball great (Lenny Dykstra) would know how to run the bases. Anyway, the game was 4-2 in the bottom of the fifth when the rain came pouring down. There was quite a bit of lighting too. The weather forced all the fans out of the bleachers and into the concourse. We were stuck in these conditions for a half an hour before it cleared up just enough to go to the parking lot. It was jam packed in the concourse. People began filing out after about ten minutes, dashing to the parking lot. The severe lighting and thunder resulted in screaming little kids. Not fun to be stuck there for an elongated period of time, but at least we got out of it. On our way home there was a car carrier parked on the shoulder of I-95. The back left tire of the last car was engulfed in flames. The car was low to the ground so it could have scraped the pavement. It also could have been struck by lightning. Luckily, we passed the truck soon after the fire started so there was no traffic, but the travel lanes were eventually closed so the incident resulted in serious delays for other people. The game will resume at 5 p.m. today. The game scheduled to be played today will start 30 minutes after the conclusion of yesterday’s game.